Mike Moustakas, 2007 Royals first-round pick, and Astros slugger Koby Clemens were among those selected Tuesday to the 2010 Texas League All-Star Game. Despite missing the first two weeks of the season, Moustakas leads the league with a .339 average and 54 RBIs and ranks second behind Clemens with 14 homers for Double-A Northwest Arkansas. Clemens, who led the California League in average and RBIs last season, is putting up big numbers again -- he tops the circuit with 16 homers and ranks second with 44 RBIs. Moustakas is one of only four players in the league batting over .300. He was hitting .420 on May 5 and has begun the month of June batting .374 after the Royals said he won't get called to the Majors this season. The Texas League All-Star Game, hosted by defending champion Midland on June 30, will feature an exhibition between the North and South divisions. Rosters were voted upon by managers, broadcasters and beat writers, who each cast a ballot for the players in their particular division. Moustakas anchors a stocked North roster, which also includes teammate Clint Robinson, a first baseman/DH who ranks third in the league with 41 RBIs. The North infield includes Springfield catcher Steve Hill, who is third with 39 RBIs, and Cardinals' first baseman Curt Smith, who is in the top 10 in most offensive categories. 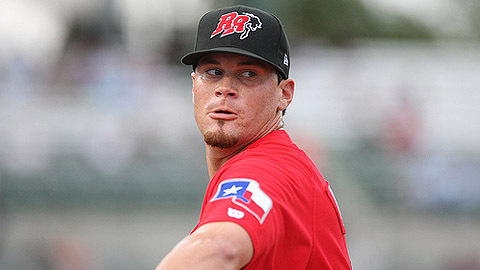 Blake Beavan, the Rangers' first-round pick in 2007, leads the league with eight wins and heads the North's pitching staff. Beavan (8-3, 2.58 ERA) is joined by Rockies prospect Bruce Billings (5-3, 2.73), who pitched a 39 consecutive scoreless innings for Tulsa this season, and Springfield's Dave Kopp, who is 8-1 with a 2.61 ERA. Clemens, batting .353 this month, leads a South roster that includes Midland third baseman Alex Valdez and Corpus Christi's J.B. Shuck, who are tied for the league lead with 71 hits. San Antonio's Matt Clark is third in the league in homers (12) and RBIs (41), and Northwest Arkansas's Derrick Robinson leads the circuit with 28 steals and ranks fourth with 68 hits. Texas catcher Taylor Teagarden, sent to Double-A to receive more consistent playing time, was voted to the team as a backup catcher. The 27-year-old, who's spent parts of the last three seasons in the Majors, including all of 2008, is batting .264 with two homers and 16 RBIs in 24 games for Frisco. Second-round pick Craig Italiano tops the league with 12 saves for San Antonio, and Corpus Christi's Doug Arguello (6-3, 2.73 ERA) is second among all pitchers with 66 strikeouts and six wins. The Nats' Edgar Osuna owns the league's best ERA -- 1.77 -- and rounds out a staff that also features Corpus Christi's Jordan Lyles (59 strikeouts) and former first-round pick Mike Montgomery, who will miss the game due to injury. Northwest Arkansas' Brian Poldberg will manage the North squad, and Midland's Darren Bush takes his entire RockHounds staff to the South dugout. The event will also feature a home run derby June 30 following the Scott Seator Memorial Golf Tournament and 20th Annual West Texas Sports Banquet and Memorabilia Auction. * Three of the original Texas League All-Stars cannot play due to injury. Springfield right-handed pitcher Scott Gorgen, Tulsa outfielder Jeff Kindel and Northwest Arkansas left-handed pitcher Mike Montgomery were replaced by Brian Broderick, Tim Smith and Tim Kiely respectively. The Texas League announced three more changes on June 18. Arkansas pitcher Kiely, Midland pitcher Beau Vaughn and Corpus Christi shortstop Wladimir Sutil have been promoted to Triple-A. Their replacements are Luis Coleman, Ryan Tatusko and German Duran respectively. On June 22, the Texas League announced that Corpus Christi's German Duran is unable to play and will be replaced by Jeff Baisley. The league also replaced Midland's Travis Banwart, who was promoted to Sacramento, with Jared Lamsford.